Based on the North Essex, South Suffolk border Sandarac is the UK and ireland distributor for Schatten Design acoustic instrument pickups. We work hard to ofer some of the finest acoustic instruments for classical, jazz and flamenco players. 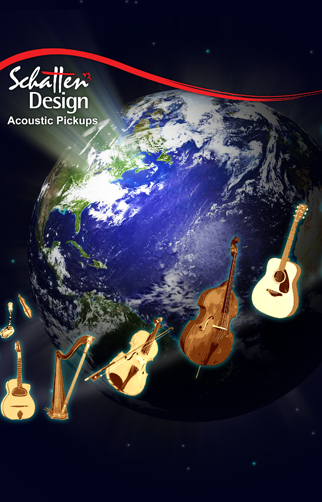 For acoustic instrumentalists of whatever genre we are proud to endorse and exclusively represent Canada's finest acoustic pickup maker, Schatten Design in the UK and Ireland. With a pickup for almost every acoustic instrument you can think of, and probably more than a few more you couldn't, these pickups will be able to get the player heard over the loudest of band members. With good margins and no minimum order quantities these well-respected pickup solutions will compliment your store product mix and provide the potential for additional revenue when expert fitting is recommended. For more details please call or make contact online. We would be very happy to discuss your specific needs and get you started as a Schatten Design stockist. Click here for a copy of the curent product brochure. Trade pricing on request.